Culturally most of us became aware of the bucket list concept through a film in which two people facing terminal illness decide to do all the things they always wanted to do before they "kicked the bucket". What's on your bucket list? Take a minute, especially if you never have, to think of a few things that you would love to do before you say goodbye. It's impossible to dream too big. Where do you long to go? What activity do you dream of trying? The list could be endless! If you don't have a bucket list then I seriously hope you will write one. Then, after you write it, I'd like you to do something else. Please, throw the bucket away… Seriously. Keep the list… Rescue the list… The list serves you well. The bucket however, does not. 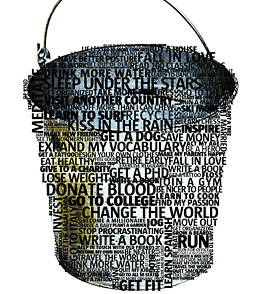 The bucket is a great unifier in that it points out that we all, eventually are going to "fall asleep". What the bucket can't do is tell us when. Because we don't know when we will die, we also don't know how old we are. Stay with me on this. If you are thirty-five years old and you knew for a fact that you were going to be happy, healthy and have all your marbles until your 105th birthday and then you were going to die painlessly in a skydiving accident, you would see yourself as pretty young. If on the other hand you are twenty-two and you found out that in five years a tragedy would claim your life, twenty-two becomes pretty old. We hear all the time about people who have been given two years to live still going strong years beyond what the doctors thought. Uncertainty equals urgency. Urgencyto live Abundantly Adventurously Filled with love Filled with joy Free of regret Sell your house Buy a house Hit the road Settle down Tell her that you love her Tell her that its time to readjust Buy that ukulele Sell your vespa and buy a one way ticket to Seattle Yes… you need to count the cost. No… recklessness will not serve you. But remember sometimes restlessness is worse for you than recklessness. Don't live in the bucket. Live in the list! To schedule a free 30 minute, sample life coaching session email thatlifenow@gmail.com or call 978.994.0431 today!